6:00pm to 9:00pm. Bring your dogs and cats to their “Pet Nights with the Easter Bunny” on Tuesdays, March 28 and April 4 from 6-9 pm. Photo packages available for purchase. For more information, call (314) 288-2020 or send tweet @WestCountyCenter. Please park in the parking structure off Ballas Road, and use the mall entrance next to Macy’s. The Easter Bunny will be located on Level 1 near Macy’s. 12:00pm to 3:00pm. A $10 cash donation to “No Time To Spare Animal Rescue & Sanctuary” will get your furry friend a picture with the Easter Bunny!!! There will also be an egg hunt going on that the dogs can participate in. NTTS will also be bringing adoptable pets to this event, so let all of your friends know who are looking for a new best friend! (314) 801- 7221. For all the details visit the event page. 6:00pm-9:00pm. Chesterfield Mall says: “Pet nights are on Tuesdays and Thursdays from 6:00pm – 9:00pm during the first 2 weeks of April. Please remember that all animals must be leashed or caged, and, that only domestic pets are allowed.” The Easter Bunny has a new location this year in “center court”. As long as your pet is leashed or caged when entering the mall, you will be fine entering the Mall from any door. Two Easter Egg hunts begin PROMPTLY at 11:00am AND 1:00pm only at TU – Ladue location! Registration opens one hour before the hunt begins! Online registration is also available. Cost: $5 registration fee per pet benefits St Louis English Bulldog Rescue, with 100% of your registration fee going to this rescue! Join Treats Unleashed for their annual egg-stravaganza! Thousands of Easter eggs, filled with a treat or prize, will be “hidden” on the lawn for your pet to find. Once the hunt begins, – if your dog’s nose touches the egg, it is his/hers! One GOLDEN EGG will be hidden in each area, to be redeemed for a Giant Easter Basket filled with toys and treats for one lucky dog. And much much more. Visit the event page for all the details. Hunt begins at 11:00am sharp! Dogs on a leash hunt for Easter Eggs! When the dog touches one of the plastic eggs with his/her nose, – into your basket it goes. (Please bring your own basket or bag to hold the eggs.) Eggs filled with treats and other prizes for your pup. Bring your camera to get a photo of the Easter Bunny with your dog-gone cute doggy. Limit one dog per person. Call 314-645-1476 anytime during business hours to pre-register. Page 17 WinterSpringExtendedBrochure2017. Noon to 1pm OR 3:00pm to 4:00pm. Two separate Doggie Egg Hunts! Pre-registration online required. New this year, a unique egg hunt will be offered for dogs and their owners! Two hunts will take place at noon and 3 pm. Dogs will search for 10 golden eggs, and then redeem them for a special prize! All dogs must be registered ahead of time in order to participate. Adults and children accompanying their dogs are admitted at no charge. Dogs must also be well-behaved and leashed at all times, up-to-date on all vaccinations, and have a visible rabies ID tag. Puppies must be 4 months or older to participate. 3:00pm. 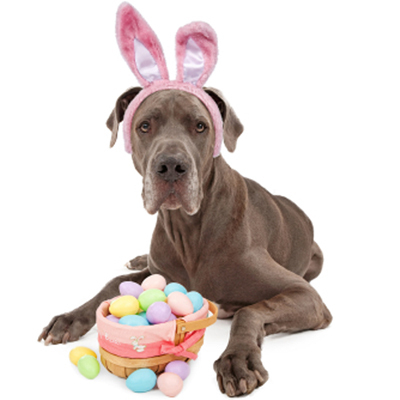 Dog treats and prize eggs will be hidden in Larson Park for your furry friends to find. Bring a basket for your Beagle and a camera for your Chow. Peter Cottontail will be available for photo ops and a caricature artist will draw the first 10 who register. Visit Webster Groves Animal Hospital and other pet provider booths for giveaways, and get in on the drawings for attendance prizes. All pets must have current inoculations and must be kept on leash by a responsible mutt-mitt bearing adult. May the best nose win! $5.00 per dog on or before March 18. Or $10.00 the day of the event. Call 314-963-5600 to register. Begins at 2:00pm! It’s an egg hunt for your furry children! Dogs will be allowed to “find” as many treats as possible in the hunt area. Dogs must remain on leashes at all times. After the hunt ends, each dog will receive a doggie bag to take home. The Easter Bunny will be available for photos with your pet. Owners assume all responsibility for their dog’s behavior. Dogs must be current on all vaccinations. Please, no retractable leashes! You must pre-register for this event by 4/5/17!